I am editing my post, as I said I would once I received my box. I honestly did not know if I would be disappointed that I was cancelled or not. Based on this box, which remember was supposed to be SOOOO AMAZING that they just HAD to send it to ALL subscribers without their permission, I am really glad I am no longer a subscriber. The total value is: $22.46. Cravebox is a $10 a month subscription. 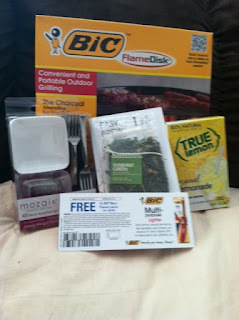 Of course, I did not sign up for the BBQ box, but the for the subscription box. If you look on their site they are listed as completely separate items. You were supposed to be able to sign up for the limited edition boxes, but they took it upon themselves to just enroll every subscriber automatically and calling it a "dual" box AFTER charging everyone. Again, my issue is that I was never given the choice that they say I will have (on the website) in enrolling in the limited edition boxes. In the end, do I feel like this box was a good value? I think it was an ok value. I am frustrated because I now have a flame disk, but of course do not have a charcoal grill. It makes that item virtually useless to anyone in my same position. The small plates and forks are cute, but I do not imagine I will use them. I WILL use the iced tea, true lemon, and lighter. I do not mean to offend anyone who is a Cravebox subscriber and loves it! I know there are many people that do. I am simply concerned that they changed the conditions of their subscription without informing their subscribers until after they charged them. In the end, I was refunded my fee for the BBQ box, and my subscription was cancelled, which did address my concerns. were you charged for the july regular subscription and the bbq limited edition box both? I don't quite understand why you were both upset at the fact that you missed the opportunity to sign up for the Limited Edition BBQ Box and upset to find out that you were going to receive that as your monthly subscription anyway. You do pay for Limited Edition boxes as well as the monthly boxes. Since you were only charged once (that is what I understand from your post) I am not sure I understand what there is to be upset about. The only thing I would think you might be upset about at this point is that they allegedly cancelled your subscription. It seems that they have decided that the BBQ box *is* the July box as well. Basically it means that there is no Limited Edition box, unless you are not a subscriber, then you receive a box if you had the chance to sign up for one. Just to clarify, my concern lies in the fact that they all along planned the BBQ box as a Limited Edition box. If you look on the site, it is listed as a Limited Edition box, not on the subscription box area. If they wanted all subscribers to receive the limited edition box, it seemed much fairer to ask subscribers if they WANTED the limited edition box. If you think about what happened in June, that is almost exactly what happened. It allowed me to CHOOSE the limited edition box. I know it seems like a petty thing, but if you read their description of the boxes, they state a difference between the two types of boxes, because there is supposed to be a difference. Do you know when we were informed of the new "dual" box? AFTER we were charged. To me, that seems like bad business practice to change the terms of the subscription and charge everyone as if nothing had changed.